This section will cover the re-entry of Skylab. The expected groundtrack (with error limits) of Skylab’s final revolution – Rev. (34,)981 – Skylab was travelling from southwest to northeast. 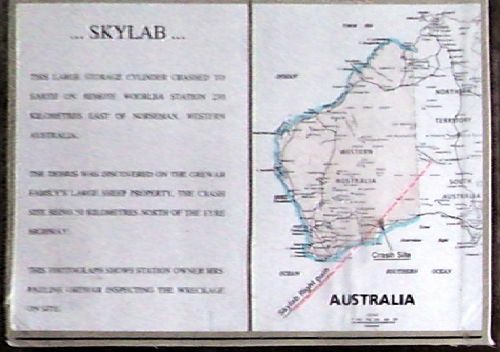 Most of Skylab fell near the southern end of the track, in the locality of Balladonia, 250km ENE of Esperance. 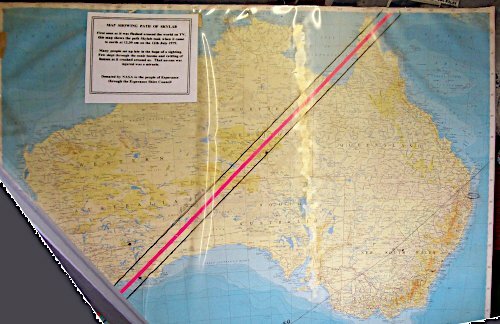 First seen as it was flashed around the world on TV, this map shows the path Skylab took when it fell to earth at 12.30am on the 12th July 1979. Many people sat up late in the hope of a sighting. Few slept through the sonic booms and rattling of houses as it crashed around us. That no-one was injured was a miracle. Note the pencil marks around centres of population – Adelaide, Canberra and Brisbane are marked on Rev. 34,980, and Esperance, Kalgoorlie and Alice Springs are marked on Rev. 34,981. Photo: Mike Linney, orthocorrection (from this photo) by Colin Mackellar. 1979 – END OF SKYLAB AND THE APOLLO ERA. SKYLAB BITES THE DUST IN AUSTRALIA. NASA had expected and planned to keep Skylab operational until the 1980s and the new Shuttle spacecraft could bring it to life again. Unfortunately by February 1978 Skylab’s days became numbered when an increase in sunspot activity warmed up the Earth’s atmosphere and caused it to expand and reach out for the orbiting laboratory. “We thought that if we could stop it tumbling and lower the drag it would stay in orbit longer. We went out to the Bermuda tracking station in March 1978 as it was the only place that still had the old Skylab ground equipment. There was a guy at Patrick Air Force Base looking at it visually and he could tell when the solar panels were facing the sun. He would call out (on a phone line) ‘It’s dark - okay now the wings are facing the sun,’ and I sent a command to turn it on and the RF down-link came on immediately. But as soon as the solar panels looked away from the sun it shut down. We only had the solar cells working - no batteries. Toward the end of April, NASA Headquarters issued its first forecast of a reentry date calculated from NORAD's model. On the 25th, when the workshop had fallen to about 320 kilometers, NORAD estimated a probability of 50% that Skylab would come down by 19 June; there was a 90% chance that it would reenter between 13 June and 1 July. This format was used consistently for the rest of the waiting period, because it was impossible to give a more precise estimate until reentry had virtually begun. NASA and NORAD did exchange information and determined the different ways the two computer models treated data. NORAD made a fairly straightforward extrapolation based on recent observations, while NASA continuously took account of changing atmospheric density and the spacecraft's drag profile as it came down. At NASA headquarters the staff went onto 24 hour duty during the three day Skylab “death watch,” beginning on Sunday, 8 July. The Johnson Space Center, the Marshall Space Flight Center, and the Kennedy Space Center stood by. Charles Harlan, Director of the Johnson Space Center’s Flight Control Division in Houston commented, "Clearly you could come in on an orbit with a lot of people and not hit a soul, or you could come in on an orbit with a few people and hit a schoolhouse and kill a bunch of kids." Telephones began to ring incessantly with serious, funny, and frightened people wanting to know what was happening and complaining their holidays were ruined. The news media moved in, and by Tuesday there were representatives from the White House, the Federal Preparedness Agency, and the Departments of State, Justice, and Defense set up in the NASA offices. News bulletins were issued every six hours, then every hour as Skylab plunged back to Earth in its final death throes over the Indian Ocean on Thursday 12 July 1979. They began 111 kilometres over Ascension Island in the Atlantic when the radar station there spotted the big solar panels begin to tear off as the lifeless hulk spun and twisted out of control. "It’s now out of range of all our tracking stations," said NASA, "The crash line is from Esperance in Western Australia to Cape York in Queensland. The chances of anybody coming to harm are minimal, but people are advised to stay indoors." In the United States all aircraft in the northeastern and northwestern areas were grounded as Skylab passed overhead for the last time. 400 members of the world's media had gathered at NASA Headquarters in Washington where a statement was issued that Skylab had come down safely in the Indian Ocean, calculated from the last radar tracks. Some celebrations had already begun in America for the safe ending of Skylab. Then, quite unexpectedly, there were disjointed reports from around the desert 800 kilometres behind Perth. "There have been reports of sightings of fragments over Australia from Kalgoorlie, Esperance, Albany and Perth," NASA officials announced. In the middle of winding up the story on the end of Skylab the journalists at NASA headquarters in Washington were electrified into action: "Where's Albany?".... "How do you spell Kalgoorlie?" .... "Where's this Perth?" and suddenly the sleepy little outback towns of Kalgoorlie, Albany, Rawlinna, and Balladonia were thrust into the world's major newspaper and media headlines. Captain Bill Anderson was flying his Fokker Friendship 200 kilometres east of Perth on his final approach to Perth airport when his first Officer Jim Graham saw a blue light through his left window. Anderson: "We first saw it at 12:35 local (Perth) time we would have watched it for about 45 seconds. I had the impression it was a bubble shape. As it descended it changed from a bright blue to an almost orangey red and you could see the breakup start to occur. It finished up as a very bright orange ball in the front, and the remainder behind giving off sparks. It was a very long tail, perhaps several hundred miles long." Bradley Smith, an employee at Perth's Bickley Observatory, described his sighting: "We first saw it as a light behind the clouds. It was travelling from south to east about 9° above the horizon. If you can imagine a train on fire with bits of burning fire all the way down the carriages that's what it was like." 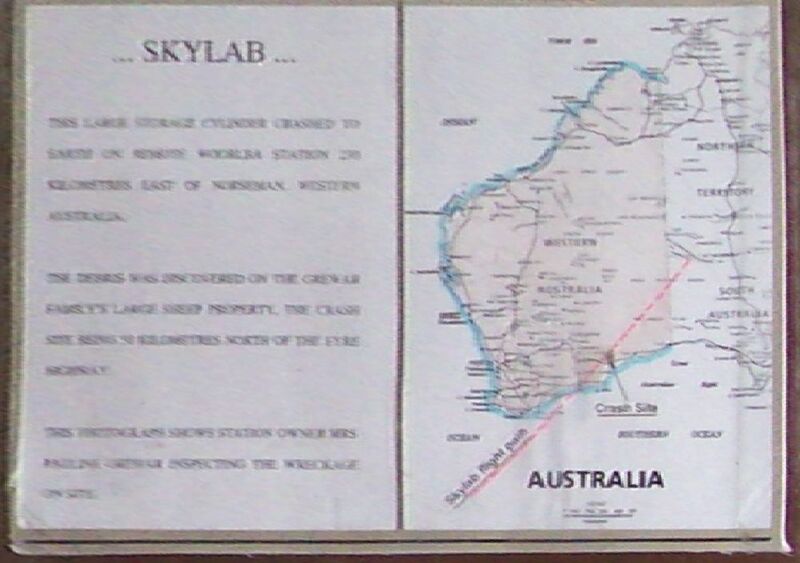 John Seiler, managing the remote sheep and cattle station of Noondoonia 850 kilometres east of Perth saw the final moments of Skylab with his wife Elizabeth: "I was watching for it and saw it coming straight for us. It was an incredible sight hundreds of shining lights dropping all around the homestead. They were white as they headed for us, but as they began dropping the pieces turned a dull red. The horses on the property ran mad. They galloped all over the place, and the dogs were barking. We couldn't calm them down. Then we could hear the noise of wind in the air as bigger pieces passed over us all the time there was a tremendous sonic boom it must have lasted about a minute. Just after the last pieces dropped out of sight, the whole house shook three times. It must have been the biggest pieces crashing down. Afterwards there was a burning smell like burnt earth." One cow was reported killed and the San Francisco Examiner offered a $10,000 prize for the first piece of Skylab to be delivered to their offices. 17-year-old Stan Thornton was watching the scene from the roof of his home in Esperance in Western Australia and saw, “......this bunch of brightly colored lights, followed by big sonic booms." His mother had heard something hit the roof of their shed in the backyard so he climbed up and found sizzling hot pieces of metal lying there. Within a day he was bound for San Francisco where he collected his prize. 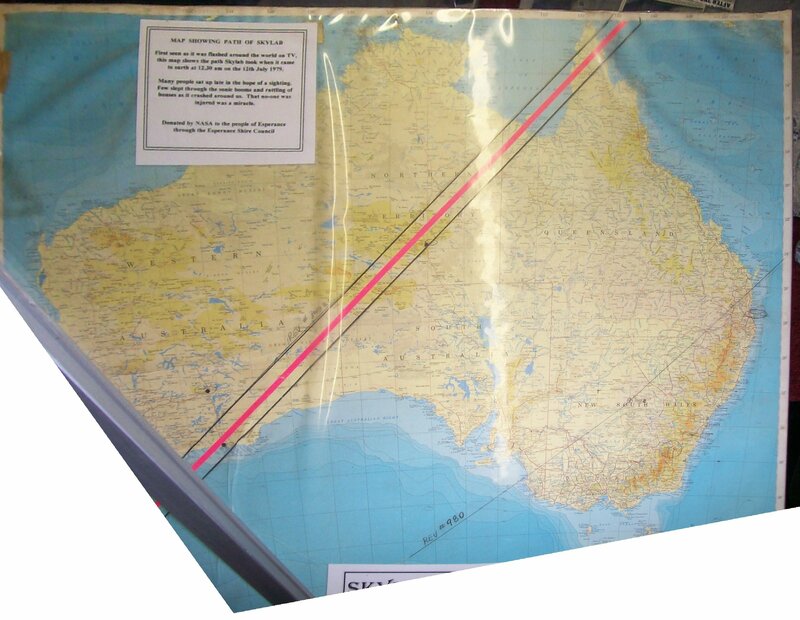 NASA officially revised its reentry bulletin to: "Skylab re-entered the atmosphere at an altitude of 10 kilometres at 2:37 a.m. (Eastern Australian time) at 31.8°S and 124.4°E just above the tiny Nullarbor Plain town of Balladonia." Burning pieces of Skylab were scattered over an area 64 kilometres wide by 3,860 kilometres along the flight path. I was concerned to learn that fragments of Skylab may have landed in Australia. I am relieved to hear your Government's preliminary assessment that no injuries have resulted. Nevertheless, I have instructed the Department of State to be in touch with your Government immediately, and to offer any assistance you may need. Thank you very much for your message. It appears we can all breathe a sigh of relief. While receiving Skylab is an honour we would have happily forgone, it is the end of a magnificent technological achievement by the United States, and the events of the past few days should not obscure this. If we find the pieces, I shall happily trade them for additions to the beef quota. Skylab, made up of Apollo moon mission leftovers, took 6 years, 1 month, and 27 days to travel 1,413 million kilometres after 43,981 orbits of the Earth. Dr. George Mueller's dream ended up as a few charred and twisted souvenirs of metal and fibreglass recovered by locals and tourists of the outback of West Australia, briefly setting off a mini boom in fragment hunting as NASA, and other organisations reportedly offered rewards of thousands of dollars for the biggest chunk of Skylab. Some of the wreckage found went on display in museums and institutions around the world. One piece of aluminium, thought to be a door weighing 82 kilograms, was found near Balladonia. The demise of Skylab brought to an end the first steps to send Americans into space. Skylab was the last operational item left from the Apollo days. It chose to end its life between the original Australian Project Mercury stations of Muchea and Red Lake full circle from where the whole adventure had begun from Australia's point of view, just under twenty epoch making years before. 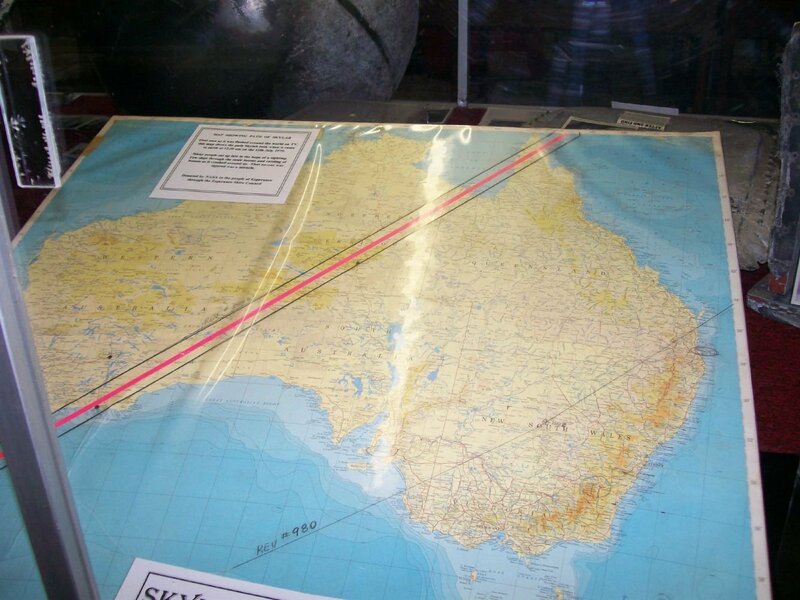 This groundtrack map is on display at Esperance Museum. Photo: Mike Linney, orthocorrection by Colin Mackellar.